West Orange, New Jersey, 17.11.1903, 6.993 Shares á $ 100, #27, 19,7 x 27,7 cm, grün, schwarz, lochentwertet, kleine Fehlstellen am Rand unten, Knickfalten, Erhaltung VF, Abbildung einer Frau mit Blitzen, US-Landkarte im Hintergrund, ausgefüllt von Thomas A. Edision, Original-Signatur Thomas A. Edison als President (lochentwertet), ausgestellt auf und rückseitig signiert von Thomas A. Edision (sehr gut erhalten). Das Zertifikat repräsentierte 69,93 % an der Gesellschaft und ist daher per se ein Unikat! Das Papier repräsentierte Thomas Alva Edisons Anteil an seiner Gesellschaft! West Orange, New Jersey, 17 November 1903, 6,993 Shares at $100 each, #27, 19.7 x 27.7 cm, green, black, cancellation holes, minor parts missing at lower margin, folds, Condition VF, vignette showing a woman with electricity flashes, map of USA in the background, original signature of Thomas A. Edison as president (some cancellation holes affect the signature), also issued to and signed by Thomas A. Edison on the reverse (very good condition!). 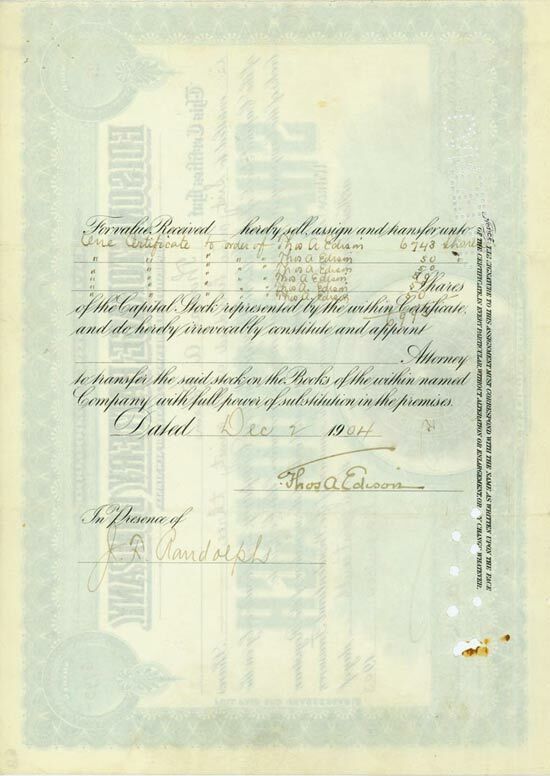 The certificate was for Thomas Alva Edison’s share of the company. It represented 69.93 % of the whole company. Therefore it is a real unique item! Already at the age of 12 Thomas Alva Edison had to earn money so that his family could survive. He published his own newspaper at age 15 and later on joined the railroad as a telegrapher. His more than 1,500 inventions include for instance the light bulb and the power plant, and also the prefabricated house. 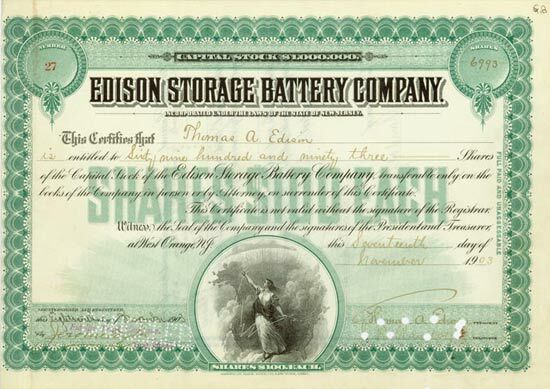 The Edison Storage Battery Company was founded in 1901. With this company Edison exploited his invention of the accumulator. In 1904 already 450 people worked at the company. The first accumulators were produced for electric cars. But there were several defects. Several Customers were complaining about the products. When the capital of the company was spent Edison paid for the company with his private money. Not until 1910 Edison showed a mature product: A Nickel-Iron-Battery with Lye as liquid. Already in 1890 several Edison Companies merged to form the General Electric Company (GE). GE was in 1896 one of the first twelve companies added to the Dow Jones Index. GE is today the only component of the Dow Jones, which is still in the index!